MailStyler periodically checks the validity of the license used. In order to get a proper check, the computer where MailStyler is installed needs to be connected to the Internet. If the connection is not active during the verification you will get a message, asking you to connect your computer to the internet. If you want MailStyler to remain active on the computer where is currently installed, make sure your PC is connected to the Internet and press the Verify button. 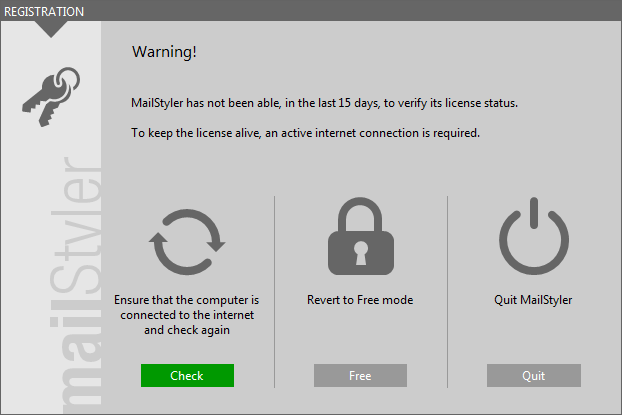 MailStyler will check the validity of your license and will allow you to keep you using the program. By selecting the Back to Demo version your MailStyler will continue to operate only with the features of the Demo Version. Select the Exit button if you do not wish to proceed with the validity check of your license. It will not be possible to use the program until the license will be checked.